The modern ‘Sky-era’ has seen the coinage of the phrase ‘Celebrity Referee’ – a disparaging term commonly used to reference a referee who seemingly seeks the limelight and courts controversy. Amongst the modern day breed who have found themselves been labelled such include: Mark Clattenberg, Howard Webb, Jeff Winters and, of course, Graham Poll. All of these referees have at one time or another been accused of playing to the gallery, at the very least. However, although the phrase itself might be a relatively new phenomena, the concept of a controversy-seeking referee certainly isn’t. Indeed one of the most contentious and well-known referees of all time is now entering his 35th year of retirement, having hung up his whistle, notebook and cards back in 1984. Step forward one Clive Thomas. Such is the infamy that surrounds Thomas and his career that even now, more than thirty years later, entire websites and chat boards are taken up by those voicing long-held grievances, real or imagined. Born in Treorchy in the Rhonda Valley, Wales, in 1936, Clive Thomas initially had designs on being a player himself. As a teenager he was a skilful inside forward deemed good enough to be offered a place on the ground staff of Norwich City. In certain quarters, this association with the Canaries is still questioned, but we will come to that later. A career-ending ankle injury forced a rethink, and so the young Thomas took up refereeing instead. Progress via the Welsh Leagues was rapid, and Thomas made it onto the full Football League list of referees by the relatively young age of thirty. There then followed a long and fruitful 18-year career in which Thomas reached practically the very top of the refereeing ladder, whist making practically not a single friend along the way. Not that this ever bothered Clive Thomas, though. A strict (some would say over-officious) style was adapted by Thomas. Cuddly and warm he certainly wasn’t. Never one to be intimidated by the stars and names of the day, it should be acknowledged that games with Thomas in the middle were usually well-run affairs. Players, in the main, knew better than to tangle with Clive either in terms of displays of dissent or the over-the-top tackles that were prevalent in those days. While nobody could doubt his handling of games, it was the constant contentious incidents that made his name within the sport in the 1970’s and ‘80’s. 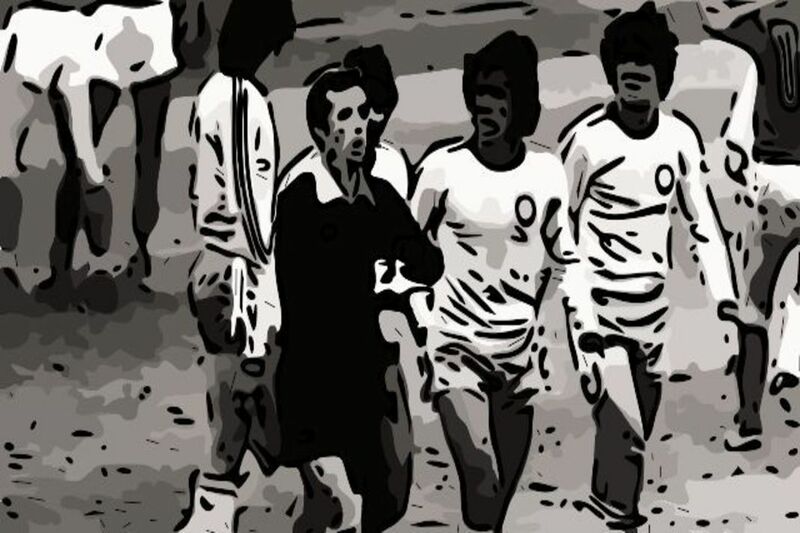 Promoted to the full FIFA list, Thomas officiated in the World Cups of 1974 and 1978, and the European Championships of 1976. Domestically, Thomas was in charge of a number of top matches including the finals of the FA Cup in 1976 and the League Cup in 1981. He also took charge of a number of FA Cup semi-finals including those in 1975, 1977, 1978, and 1981. In a large number of the games and tournaments very briefly outlined above, Clive Thomas made decisions that were at least contentious at the time, if not downright baffling. In certain cases the resulting arguments and resentment linger to this day. It is fairly certain that the passage of time has done little to ease the wounds felt by Bryan Hamilton, that’s for sure. In 1975 Hamilton was an integral member of Bobby Robson’s talented Ipswich side that was chasing the double. Having overcome a dogged Leeds United after three classic encounters in the quarter-finals, Ipswich made it through to a Villa Park semi-final clash with West Ham. An uneventful scoreless draw meant a Stamford Bridge replay four days later and a match that is still debated in certain quarters of East Anglia to this day. Another tight game saw the sides locked together at 1-1 when Ipswich had not one but two seemingly perfect goals disallowed. Bryan Hamilton was judged to have been offside in one particular decision that enraged Bobby Robson so much that he called for an FA enquiry into Thomas after the game. This in turn offended Thomas to the degree that the two men held each other in contempt and animosity for the rest of Thomas’ career and beyond. “Such an outburst by a manager does no good to the game. I would agree with Robson that the administrators failed to do their duty – but only by not taking a grip of him and giving him a warning. A member of the appeals committee that heard the players’ case was Mr Bert Millichip, chairman of the FA, who appointed Robson to his England post. I wonder whether they said even a single word to Robson”. Thomas also stated that from then on Ipswich Town captain, Mick Mills, made a point of never shaking Thomas’ hand again, even during pre-match toss ups. To this day a not inconsiderable number of Ipswich fans not only continue to rue Clive’s decisions at Stamford Bridge that day, but also remember the name of the club where Thomas the player cut his teeth seventy years ago and mutter dark conspiracy theories accordingly. Whatever the merits of that particular decision, two years later poor old Bryan Hamilton was on the wrong end of another Thomas decision, and again it was while wearing blue in an FA Cup semi-final. The all-Merseyside semi-final of 1977 was entering its final stages and, with the teams locked at two goals apiece in a titanic tussle at Maine Road, Bryan Hamilton turned in what appeared to be a late winner for Everton. However, to almost universal puzzlement in the stadium, the goal was disallowed for some unspecified reason. After the game Clive Thomas refused to clarify the reason for disallowing an almost certain late winner, saying only that the decision was not because of offside. At various points in time Thomas has implied that he blew up for handball against Hamilton that he allegedly ‘sensed’ rather than saw or else simply refused to talk about the incident whatsoever. Perhaps the most famous of all Clive Thomas controversies occurred during the 1978 World Cup in Argentina in a group game between Brazil and Sweden. With the game entering injury time tied at 1-1, Brazil won a corner on the right. Allowing time for the corner to be taken, Clive then famously blew for full-time as Brazil legend Zico rose to head the ball past the Sweden goalkeeper and into the net. Brazil were apoplectic and protested long and hard accordingly, but Thomas was, and remains, adamant he had added on exactly the right amount of time and had he allowed the goal it would not have been an honest decision. In a book written in 2009 by one of the most known of all ‘celeb refs’ of all, Graham Poll, the decision was revisited by Poll himself, and perhaps unsurprisingly, criticised heavily. Upon being told Poll’s opinion, Thomas dismissed Poll and his thoughts with a curt: “I’ve got no time at all for him”. Indeed. Speaking in an interview many years after retirement Thomas reiterated his feelings on the topic of honesty. “I’m not by any means suggesting people have always agreed with a decision (of mine), but they have always been satisfied that what I have given has been an honest decision”. While perhaps Bryan Hamilton and Mick Mills might still have trouble digesting those words, it is true that Clive Thomas did seem to command the respect of most players. He was the only referee to ever send off ‘hard-man’ Tommy Smith (for dissent) in his Liverpool career, for example. One wonders how Thomas would have fared had he been refereeing in the modern era with its attendant media focus 24 hours a day. One suspects, however, it wouldn’t have fazed him in the slightest and he would have risen to the challenge accordingly. In his autobiography he waxed lyrical on the state of the game (in 1984) and the rule changes he advocated going forward. Among these suggestions were red cards for the denying of goal-scoring opportunities and the possible introduction of further officials on match days. Away from football Clive Thomas was a successful businessman and is now retired and living quietly back in his native Wales. He occasionally ventures out onto the after-dinner circuit where he reportedly steadfastly refuses to answer questions pertaining to a certain Bryan Hamilton. Previous articleUnsung hero Paul Power: From stand-in to League Championship Winner 1987!